So here we are at the end of NaBloPoMo, the very end, really. Normally a morning poster I've evolved into an evening writer as the month has gone on. Something to do with neglecting Kizz & Tell so sorely perhaps. I'm a lot closer to the very last moment of the month than I thought I'd be. I'm here, though, and there has been very little doubt that I would be. As I'm sure you know by now I'm a huge fan of tradition. Huge. It's like routine but with treats! So it should come as no surprise that I love NaBloPoMo. The enthusiasm for this tradition has, I'm hearing, waned a bit. Even Eden Kennedy, the founder, spent one of her posts this month talking about how little she cared for it this year. To each their own, I know, but I'm always somehow personally offended when a tradition gets blown off the rails (known in sane circles as "changes"). On Friday I had my annual post-Thanksgiving open house. I don't cook for Thanksgiving Day I cook for the day after. People have their own traditions on Thursday and I ask them to come tell me all about it on Friday. Starting a tradition is hard. I used to have a Thanksgiving Day tradition but then I broke up with the guy I started it with and a went off for a year in another place and somehow I just lost the tradition in the divorce. Other people cooked and invited guests and my place in the heirarchy and the joy of it slid away. It took me a few years to get my feet under me and try to create something new. I figured the Friday open house format was low commitment. If it didn't work out so well I'd be less disappointed. I was a little disappointed a couple of years even so. Like I said, it takes time to build a tradition but I kept going. This year I almost didn't. I was tired, I have a new dog who consumes my brain, I'm not feeling flush with cash but a couple of people had been asking about it and I'd already half invited someone new so I just went through with it. On Friday nearly 25 people wandered through my house at one point or another. Some brought food, some drink, some flowers, some stories, some skills (turkey carving, someone always has to bring that 'cause I don't have it). I was so full of food and drink I could barely move and I was exhausted by the end of the night but I'd gotten to talk to nearly everyone in depth and I'd gotten to eat all I wanted. For me it was just the kind of day I'd hoped to create. Then there was more. At least two people took me aside and told me that they had counted on this party. It was something they looked forward to each year and no matter how odd or non-traditional or even difficult their Thanksgiving was they knew that my house would be open the next day. That, my friends, is how you know your habit has earned the title of tradition, when other people look forward to it. NaBloPoMo can be hard. It speaks of pressure and, like its inspiration, NaNoWriMo, people do it because of that. Pressure can inspire. Of course, one of the things it often inspires is complaint. So, if you keep up with people who are NaBloPoMo-ing you read a lot more moans and groans than you do honest reflections about the experience or brilliant tools to handle the difficulty. Knowing that, I expect that Eden Kennedy doesn't hear much of what I heard on Friday. To close out this NaBloPoMo then I'd like to tell her, thank you for creating this tradition. I count on it and it makes me happy. Hi Kizz, I used to have a tradition like yours, of cooking for my friends I still miss it, life changes and now we sell Christmas trees so I try to get my fix by sharing goodies with total strangers and their families as they come to our small farm to buy a tree. I noticed that many bloggers struggled with NaBloPoMo this year, good for you for sticking with it. Traditions are a good thing. Thanks for writing, I appreciate the effort. Wow, isn't that a good feeling when you hear that? I'm so glad you continued it. Your Friday Thanksgiving is a great tradition...So, I looked at the pic of your spread and thought, "Cheese? I didn't have any cheese. How did I miss that cheese?" 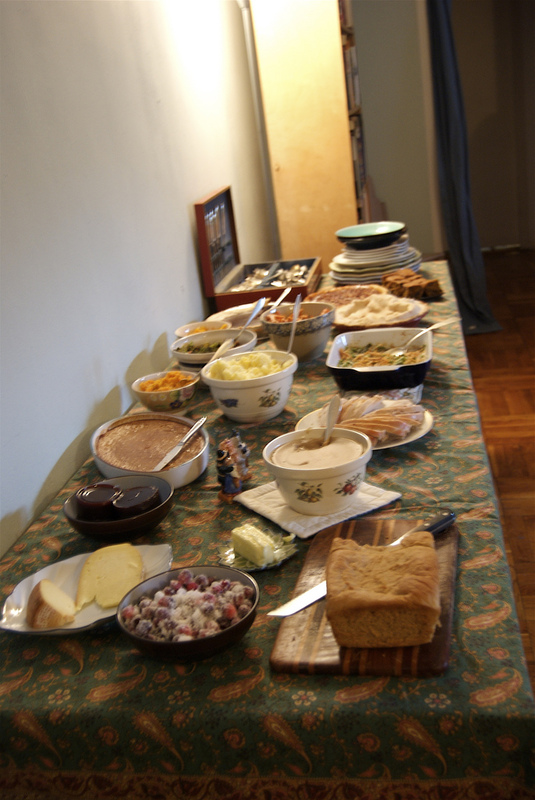 Then I realized that that is a pic of last year's Thanksgiving spread, and that I indeed did have some of that cheese which you had bought at the farmers market. Mmm, that was good cheese.